I've actually been somewhat interested in Jumanji: Welcome to the Jungle. Whenever I hear Dwayne Johnson is in a movie, I always give it the benefit of the doubt. Sometimes it doesn't work out, like with Baywatch or Central Intelligence (in my opinion). Or you get something really fantastic, like with Moana or the latest Fast and Furious movies. But just because of how much I like him as an actor, an entertainer, and as a personality, I always give his movies a chance. While I didn't exactly care for Central Intelligence, I had said in my review that I wanted to see another movie with Johnson and Kevin Hart, because I thought they had real chemistry. So seeing that they were back together for this movie was intriguing. Jack Black is a comedic genius, so he always adds to any film he joins. The question mark for me, in terms of the cast, was Karen Gillian. I have only seen her in the Guardians of the Galaxy films, and I think she's the weakest aspect of those movies. She overacts as Nebula, and I had no idea how she would actually do in this movie. So all of this combined gave me an mild interest in the film, but nothing super overwhelming. But now, we have our first trailer for Jumanji: Welcome to the Jungle, and it took me by surprise! I really liked this trailer a lot! I loved the Breakfast Club kind of set-up in the beginning. At first I thought it might get old quick and be too stereotyped, but I think those kinds of teenage stereotypes will play perfectly into what this movie is actually going to be. By far the funniest part of the trailer was when each of the characters were figuring out who their avatars were. They did a great twist, by having the snobby rich girl end up being Jack Black, and the more conservative girl be the more revealingly-dressed Karen Gillian. It was just a fun switch that you know will be a great comedic hallmark for the entirety of the film. The visuals and the CGI look incredible. I didn't anticipate how large scale this movie was going to be, and it looks gigantic! The action looks intense, and it looks to be something genuinely different than we've seen before. As a whole, this film looks very different from the original Jumanji movie, with Robin Williams, which I think is quintessential to making this film work. All the cast has repeatedly said that this movie will honor what Williams did, and I tend to believe them. This film could end up being a giant, messy CGI explosion with no depth or real story, but after seeing this trailer, I'm leaning towards it actually being a really fun time at the movies. We'll have to wait and see how it actually turns out. What do you think? 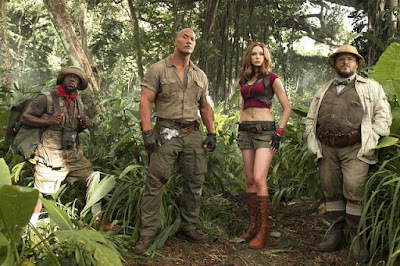 Did you like the first trailer for Jumanji: Welcome to the Jungle? Are you looking forward to seeing the film? Leave your thoughts in the comments section below.